The Ukrainian Antarctic station is 23 years old. How did everything happen? 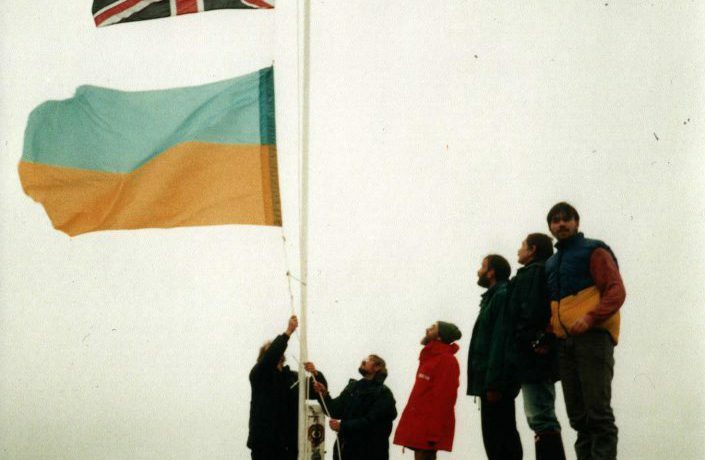 On February 6, 1996, over the Antarctic station, which the Great Britain had transferred to Ukraine, the blue-yellow flag was raised for the first time, and the station already called Akademik Vernadsky, began its new history. The first panel is now kept by the head of the Ukrainian team of winterers, which took the station, physicist Gennady Milinevsky. “By the end of wintering, the wind had so frayed the flag that it decreased by about three times. So the next expedition brought a new cloth “, – says Gennady. Currently, the state flag flies over the main building of the station, and in those days the flagpole was installed on the rock closer to the meteorological site. “At 18.45, the base commander of the Faraday station, Duncan Haigh, took off the British flag, and I raised the flag of Ukraine,” recalls Gennady Milinevsky, looking at this historical picture. On the photo at the flagpole on the left: Duncan Haigh, then me – raising the flag, on the right – the deputy director of the British Antarctic Syrvey, John Dewdney – holds the flag of his country. Next are our doctor Volodymyr Pavlyk and mechanic Yevgen Gurianov, on the end there is the youngest winterer diesel-mechanic Andriy Sydorivsky”. Photo of this historical moment was made by a geophysicist Volodymyr Bakhmutov, who, by the way, will celebrate today the birthday of the Ukrainian Antarctic station right on the spot – now he is at Vernadsky as part of a season expedition. In Antarctica, there is now one more witness of the history – the head of the 23rd UAE Viktor Sytov was among those who in the winter of 1995-1996 took the station from the British. With this day, February 6, 1996, another fact is connected, which today is perceived as a legend, – about one pound, for which the Ukrainians “have bought” the station from their British colleagues. However, this is not a legend. “Faraday Base Commander has jokingly hinted at the symbolic payment for the station. I just had British money, because we got to Antarctica through the Great Britain and the Falkland Islands, so I took a one-pound coin and gave it to Haigh. He immediately ran into the workshop, grabbed the tools and immediately “immure” that coin into the countertop of the Faraday bar, which is still there, ”- says Gennady Milinevsky. Because of the malfunction the helicopters, which had to take the British team to the Endurance vessel, have appeared only about 3 p.m. and the transportation of a part of the team and cargo began. Helicopters made several flights. In the evening, at 18.30, we climbed to the flagpole on a rock, and at 18.45 Duncan has sadly lowered his national flag, and I raised ours. In a few hours I wrote in my diary: “It has been done! Ukraine has become an Antarctic state. The result of two years of work, nerves and health has been successfully completed “.